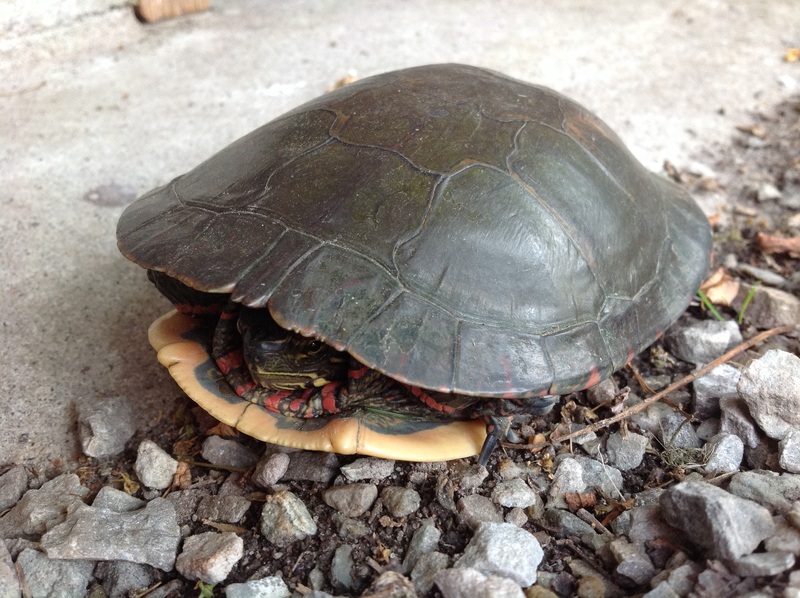 A painted turtle recently crept into the yard, hardly daring to move once discovered. It thrust its head beneath a thickened shell, a secure shield from what it deemed to be unyielding and unwelcome curiosity with untested intentions. In its quest to determine whether we were friend or foe, it pulled back inside to observe and to know, to regroup in the safety of external protection. We may at times become side-lined in rocky terrain, crawling at the pace of ‘pause’ while others race by. We may wonder how long the hurdles we face will last, if the hastier hares will not only win the race, but disprove the ‘slow and steady’ counsel of obedience and trust when hostile territory becomes our front yard view. And if this season is particularly long, we may turn from retreat into hiding, to simply pull in our necks and peer at the world from what we deem to be a safer corner, our greatest goal being to avoid that which is hurtful and waiting for danger to pass us by. The danger then is that we become encased in prisons of our own making, paralyzed and still under hardened shells of distrust and discouragement. The race of faith goes on, but not for us until we come to trust the character of God, open to the Spirit’s movement in our lives no matter how difficult things appear. 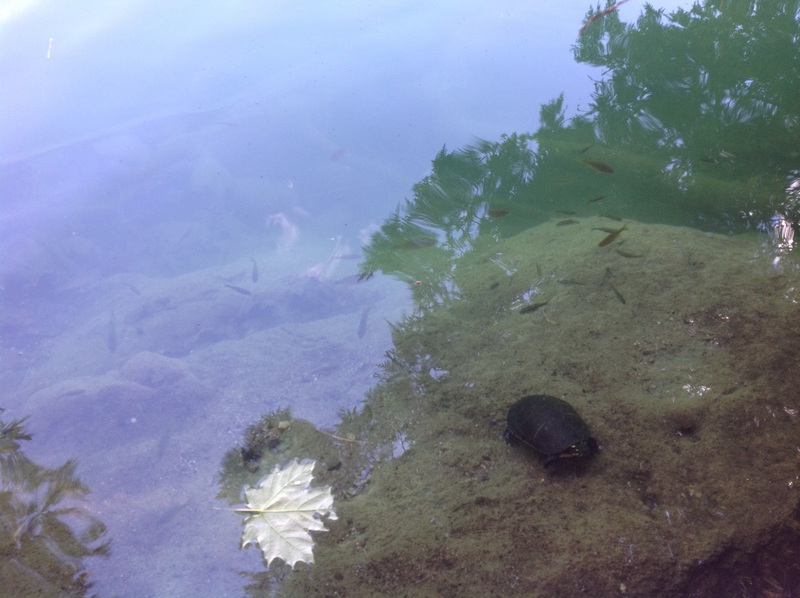 What if the rocky foreign path upon which we’ve been led is where the seeds of his love can be best laid in great duress to bear new life just as a turtle buries her eggs in rocky places in the hope that some will make the treacherous journey to the water’s edge and live? What if it is in this place where all outward appearances betray nothing but stoney and infertile ground that we are given eyes to see a mound of soil awaiting the enriching word of hope we have been called to bear? What if it is here where the emptiness of human toil without Christ is most clearly revealed and causes us to step out in renewed faith to re-treat the world with the good news of grace hurtling across time and space as it was painted on a cross? Retreat and taking time for multi-faceted reflection is not defeat. It is wisdom, seeking to understand our times and seeking to know just when and where and how to plant this God-breathed word which quells all fear. It is resting in Christ until he mitigates the darkness of uncertainty and releases confident faith to walk however slowly through the threats we face along the way with courage. The ancient Roman Army utilized a military tactic known as the ‘turtle formation’ where soldiers, side by side, held up shields together to create a secure cover under which they could both endure a great onslaught of weaponry unscathed and further their mission without being unnecessarily waylaid by opposition. As servants of the gospel of grace, we often find ourselves in unfamiliar territory, but we have an eternal Shield who has drawn us into relationship with a great circle of believers and is himself our ever present home. Here we raise shields of faith together with those who journey in his name to stand as one and wash the world in his love against all offence until his kingdom comes. One day, there will be no more need for retreat … we will sit at his feet, open and free. With this confidence, we stick out our necks week by week with a counter-cultural message of hope at ease in our old shells of human frailty, and at peace in him who is our rock, our source of living water, our home. ‘Lord, you are ever aware of our circumstances. Cover your servants with infinite grace to meet each need and accurately read the times. Give us spiritual insight and help us pause with regularity to hear you to speak into our lives. Cause burdened backs of self-defence and fear to fall away, making room for your perfect strength to protect us in the hurdles we face. This entry was posted in Spiritual Formation and tagged benefit of retreat, Christ our Home, encouragement in difficult times, soul care for pastors, spiritual growth, trusting in the hard times by countrystillness. Bookmark the permalink.